Searching an HTML template for your eCommerce site? Check out Supershop, A Free Responsive eCommerce Shop Bootstrap Template. Free template for online shop. One of the most useful and helpful facilities provided nowadays on the internet is the fortune of buying and selling of the goods using the internet. Your can shop the entire shop sitting back in your house and your desired good will be knocking at your door!!! And as you are looking forward to owning one of this amazing shops you are about to get the right thing here. ‘The Free Responsive eCommerce Shop Bootstrap Template’ This one single template to fulfill all your needs. All you need to do right now downloading this amazing template and start your eCommerce shop with all possible features your customer can ask for. If you are looking for uniqueness then this Free Responsive eCommerce Shop Bootstrap Template is the rightmost choice for you! 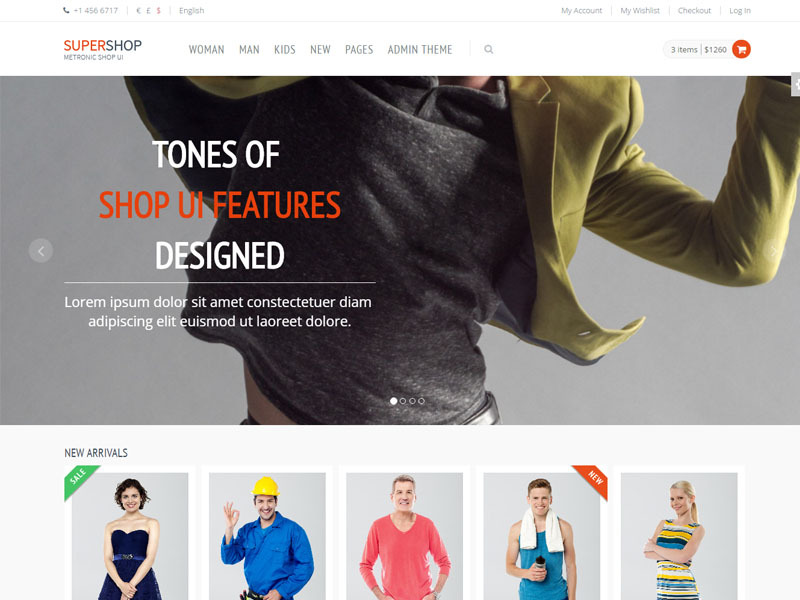 Why Supershop – a Free Responsive eCommerce Shop Bootstrap Template ? The most important principle of an eCommerce site is to represent all your available products and providing their each detail to the visitors and the customers. Supershop does this the best. Every single detail and various options to your customers to surf and find their desired product not wasting too much time. Smooth design and the fascinating outlook is the must to attract the customer to shop more and watch previews and advertise of products on pages are about to make the customer interested and browse more. What facilities are you getting from Supershop ? The main impression that works most on your customer is how your front page looks. An appropriate working frontpage has to be clean and again it has to come with as much as possible product views and details! That’s what Supershop actually does! A very fascinating looking front page with horizontal individual sections for Men, Women, kids and a New tab for the latest products available! The most important thing people look for at the first place is ‘DEALS’. Customers do like to shop in cheap and they always have a birds eye on the deal section. And this Free Responsive eCommerce Shop Bootstrap Template comes with a big ‘DEALS’ tab to deal with it! The special and attractive products can be kept moving the slider with the price and photos on it so that customers can have the glimpse of most attractive products and insist on checking the others! Personal account feature is one very good facility for your customers. They can have a look over all their previous shoppings, can make a wishlist and keep in the mind the products they want to buy in the near future. Even a data on the return lists. Newsletter option is about to provide them the latest deals and features about your site. That’s what actually today’s customers think about! Too much availability of internet shopping sites is making them impatient. With the one click of hand, your customer is gone! It’s the harsh truth. But the well-designed outlook of Supershop is much more fascinating to most of the customers and it comes with a great positive feedback. What is definitely a great asset for your business! People nowadays are surfing websites not only on their desktop, also in devices like laptop, tablet, phablet & others! And thus screen size and resolution changes from device to device! And it’s easier for the people to shop from their cellphone and tablets because of their handiness. To cope up with this situation our template is designed responsively to be optimized from desktop to mobile and vice-versa. It’s very important technology that we must adapt for both search engine ranking & various devices users. So, keeping this in mind we designed this Free Responsive eCommerce Shop Bootstrap Template template. This template will appear in high-quality HD screen devices like iMac, iPad & iPhone. The lower part of the site pages can be decorated with various kinds of advertisements. Different brand logos or badges can be used in there to let your customers know what are the brands you do offer them. Brand value is a great thing nowadays and people shop mostly on knowing brands. This advertisement of Brand names can play a great role running your great business. And you are smart enough to move forward with this Free Responsive eCommerce Shop Bootstrap Template which is better than any other premium templates and capable of changing the entire structure of your business. This template is really responsive and design is too good. Good, clear code, a lot of fantastic features, scalable on mobile devices. Sadiq ahmad, its really free? Do you from Indonesia? Yeah, it’s totally free. No, I’m not. Please can you send me the link ? Thank you. i can’t download this template can you send me download link please. I’ve sent you the link, Hussain. Hope it helps. Does it compatible with ecommerce engines like opencart? Not really. It’s an HTML template so it works that way.